Mixed Media Mosaic Hearts with Wendy Reich! Any personal or sentimental items such as charms, beads, seed beads, buttons, jewelry parts, ball chain, watch parts, rhinestones, metal findings, or other found objects of interest. The instructor will be providing a basket of embellishment items for you to add to your project as well as ribbon, findings, tools, stamps and paints. ** You can purchase SCULPEY III or PREMO clay at Michaels, Hobby Lobby or The Studio in Cobleskill. Before purchase, make sure the clay is somewhat soft by pressing your thumb into the pack if it feels rock hard find another pack. If you are unable to get your clay ahead of time, the instructor will have a limited supply of SCULPEY on hand that is available for purchase, 2 packages for $6.00. Prior to class please condition your clay by kneading it until soft then rolling into a ball and place in sealed zip lock bag, removing air. Please call 607-547-9777 or email gallery@cooperstownart.com to pre-register and/or request a materials list. 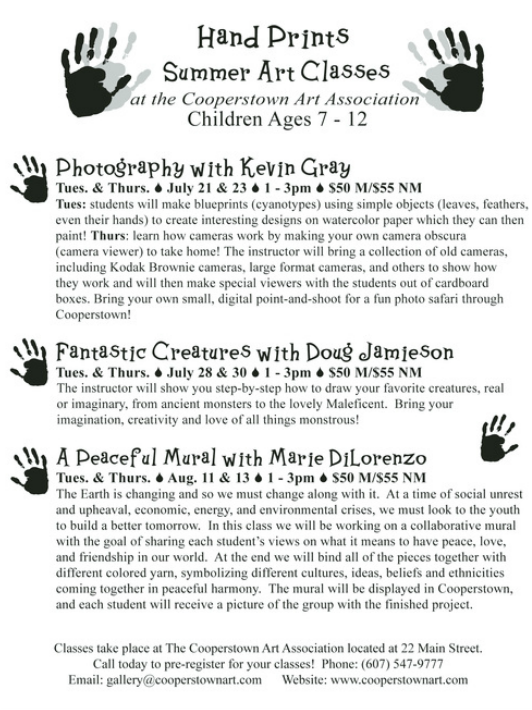 Doug Jamieson’s 4 week Draw the Head class will take place at the Cooperstown Art Association's upstairs classroom space at 22 Main Street in the Village Hall at the corners of Main and Fair Streets in Cooperstown, NY. Materials List available or materials provided in class for a fee of $10. Please call 607-547-9777 or email gallery@cooperstownart.com to pre-register and/or request a materials list. Doug Jamieson’s workshop takes place at the Cooperstown Art Association's upstairs classroom space at 22 Main Street in the Village Hall at the corners of Main and Fair Streets in Cooperstown, NY. This class is for the student with past experience with oil or acrylic painting and is taught onsite with the location changing each week. Students are given the opportunity to learn the techniques of oil (or acrylic) painting while working from life. Open studio class with or without instruction; all media welcome. Come spend Sunday afternoons at the CAA exploring new ways of seeing and interpreting the landscape! 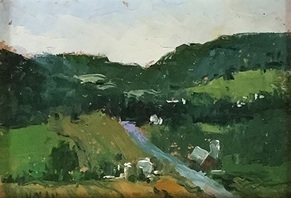 With an eye towards ultimately painting plein air (outdoors) and by utilizing older paintings and/or appropriate photographs, we will revisit the basics of design and composition, the importance of values, color mixing, underpainting, and the use of working with a limited palette. We will also experiment with different surfaces, tools, and paint application. *This class is intended for those with at least some experience with painting and/or drawing. In this class students will create a repetitive, geometric drawing using stencils of an everyday item. The focus of the class will be on overlapping shapes and using colored pencils to break them up, making a simple tracing of an object interesting. The end result will be a bright, abstract piece of art that is intriguing to the eye both close up and far away. In this class students will create a town landscape unique to the place in which they live. Drawing on the inspiration of artist David Hockney, we will be making road paintings incorporating the different landmarks, houses, parks, etc. that are found within the community. A subject that has been portrayed by many artists, students will draw on the traditions of Mexican folk art, as well as their own creativity in this class. Through the use of markers, crayons, and colored pencils, they will create a vibrant drawing of what they depict a tree of life to be. In this class children will be making one-of-a-kind Mother's Day gifts to give their mom, grandma, etc! Get ready for the warmer weather with a beautiful 3D art piece you can display at home! Color, texture and pattern will all play a role as students use tissue paper to create a mosaic of flowers and spring creatures. Spring is on its way, bringing back with it the variety of birds we see here in the northeast. In this class students will take on the drawing style of American artist Chuck Close. We will be incorporating the creative and intricate patterns he is known for, applying them to our own portraits of birds. As we head into the heart of winter, students in this class will focus on drawing polar bears. Using brightly colored pastels over black paper, they will learn to see and incorporate color into what would otherwise seem to be nothing more than a white canvas of fur. In this class each student will be using acrylic paint to create a winter scene filled with cardinals. Combining pattern and form, students will leave class with a beautiful painting to bring home. This class will focus on using watercolor to paint a winter scene of trees. Students will have the opportunity to use a template or draw their own style of trees to be incorporated into their painting. Watercolor will be our main tool, adding in the use of colored pencils, markers and crayons to accent the art piece and bring it to life! In this class students will create a unique 2016 calendar illustrated with their own art! The theme will focus on monsters and fairies, with the option of choosing one or the other, or incorporating both! Using colored pencils, markers, crayons, and their imagination, students will come up with their own designs for each month. A Step-by-Step Approach to traditional watercolor techniques such as wet in wet, masking, the use of transparency, under painting and exploration of color mixing. Subject matter will include but not be limited to portraits, landscapes and still life. There will be ongoing demonstrations and the use of photographs. Join artist, Susan Jones Kenyon in “Painting A Memory.” Work from images provided, your own images or from your inner artist. Open to beginners & serious students of ALL ages. This class is for the student with past experience with oil or acrylic painting and is taught onsite with the location changing each week. Students are given the opportunity to learn the techniques of oil (or acrylic) painting while working from life. *Bring your own materials. *Schedule flexibility is required due to weather. This workshop offers an opportunity to learn about contemporary renderings of flowers in a mosaic technique. The workshop will start with a presentation that discusses in detail ancient and modern representations of flowers and floral elements. A demo will be given on techniques, stylizations, and layouts. Students will create their own mosaic interpretation of a flower based on a photograph or a sketch using a traditional layout or Yulia’s signature brush-stroke technique. During the workshop students will also explore a color palette, flower details, composition, layout, and technical aspects of working with the stained glass modules. Images will be provided or bring your own upon approval of the instructor. Students must also bring their own tools. Please contact Yulia directly for more information and any questions. Open to adults; all skill levels are welcome. Open studio art class for adults, encouraging an atmosphere of openness and engagement for individual expression. All media welcome: oil, watercolor, pastel, acrylic and drawing. Instruction is also available. Painting from life, still life, photos and (weather permitting) plein air painting. A Step-by-Step approach to using watercolor on site at Brookwood Gardens near Cooperstown (weather permitting) or back in the CAA's classroom space. For beginners and experienced painters. Bring your own materials. 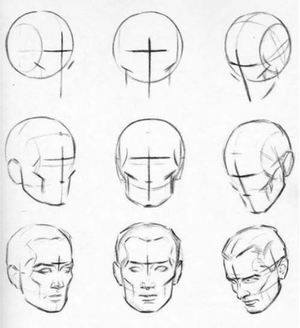 Using a clothed model the principles of figure drawing--including measurement and proportion, thrust, figure construction, folds and drapery--will be demonstrated, applied and practiced. All levels welcome. Bring your own supplies: newsprint pad at least 11"x14," charcoal, conte crayon-color-Sanguine, and a kneaded eraser. Open to beginners through more advanced artists. Students will learn a procedural approach to painting while learning the values of color mixing, glazing, wet on wet, the use of underpainting and direct and indirect painting. In each session the instructor will give demonstrations and offer hands on help. Students must bring their own paints; a suggested materials list is available for beginning students. .
Students will take on a different artistic technique in this class to create a winter scene in the form of a mosaic. Like the pieces of a puzzle we will be using cut up paper in different shapes that, when put together, become a beautiful work of art. In preparation for the holiday season students will be creating a variety of fun holiday cards that can be sent out to friends and family! We will be using stamps, paint, and an assortment of embellishments to make unique pieces of art to send out in the mail. The winter season is here and with it comes snow! In this class students will be drawing outdoor landscapes filled with skiing snowmen! Using elmers glue, colored pencils and crayons on black paper in a relief drawing technique, the final piece of art will have a stained glass quality to it. In this class, students will be putting together their own individual centerpieces that can be placed on the table at Thanksgiving, or used just as a decoration. We will be utilizing a variety of materials with an overall rustic feel that is sure to be a wonderful addition to every home! Thanksgiving is a wonderful holiday but sometimes we forget its true meaning. We all have so much to be thankful for so in this class students will be creating a calendar where they and their families may express thanks and gratitude in a colorful and creative way. Look at them each day or read on Thanksgiving to remind each other what you are thankful for. To gear up for Halloween students will construct their own 3D haunted houses complete with witches, pumpkins, bats, goblins and anything else their imagination can come up with. A perfect decoration in preparation for the next day’s Halloween excitement! Students will take on the painting technique of pointillism in this class, to create a unique self-portrait in the style of French post-impressionist painter Georges Seurat. Noted for his innovative use of drawing media and devising new painting techniques, Seurat altered the direction of modern art and is one of the icons of late 19th century painting. *Students must bring a copy of an 8"x10" photo of themselves (from the shoulders up), printed on paper. In this class we will be taking a step-by-step approach to re-create Grant Wood’s “American Gothic” painting. For a twist, students will be adding in their faces or the faces of people they know into the painting. *For this aspect of the project students must bring a copy of two photos – two people they would like in the drawing, printed on 8”x10”paper. Each student will be using acrylic paint to create their own master’s copy of Vincent Van Gogh’s famous “Sunflowers” painting. The class will be taught with a step-by-step approach that will also allow for individual creativity, so all students end up with a successful masterpiece of their own! This class will be taking a different approach to the traditional outdoor wind sock. Students will paint harvest farm scenes on a durable tin can, which will then be decorated and hung with brightly colored fabric, beads, leaf templates and more. Hang on a tree in the sunshine, or under the cover of a porch and indoors in rainy weather. In this class students will create a beautiful fall wreath with a variety of materials used in everyday life. Paint, clothespins, leaves, beads, bows, glitter and more will be incorporated to make this fall decoration come to life. Hang inside or on your front door! "From the Past to the Present: A Contemporary Take on Notable Artists"
In this class students will draw, color, and paint a self-portrait in the style of American artist Chuck Close. Although he achieved fame for his photorealism, Close is also known for the creative and intricate patterns he uses to portray a human portrait. It is this uniqueness that students will evoke in their own self-portraits. *Students must bring a copy of an 8"x10" photo of themselves (from the shoulders up), printed on paper. This class will focus on morphing the student's own creativity with that of Wassily Kandinsky, an influential Russian artist from the late 19th/early 20th centuries and who is credited with painting one of the first purely abstract works. Students will draw, color, and paint a cityscape while incorporating some of the abstract techniques seen in Kandinsky's work. In this first class, students will begin by making their own Gustav Klimt-inspired art piece, focusing on patterns and line-work in correlation with the human body. Time permitting, they will also create their own version of Leonardo da Vinci's "Mona Lisa." Spring is in full swing! Spread the happiness with a bright and festive craft you can display at home! Welcome your friends and family with a wreath complete with flowers, birds, butterflies, glitter, glass gems and more! Spring is finally here and the animals are starting to pop out of their hiding places! In this class students will create their own "goofy chicken" sculptures that they can paint, decorate, and embellish with individual creativity. Spots, stripes and different patterns abound! With the coming of spring many different species of birds will be returning to the north. In this class students will learn how to differentiate and draw a variety of these birds, which can be displayed at home or used as a reference guide for those who enjoy bird watching! Using a common item found in the household, students will create their own owl prints that will then be displayed in a uniquely decorated frame. They will also take home a painted version of their printing "plate," which can be displayed as well. Get ready for the warmer weather with a beautiful craft sculpture you can display at home! Students will learn about famous mobile artist Alexander Calder, using inspiration from examples of his artwork to make a bird mobile of their own. The birds are coming, the birds are coming! And that means they will need homes to make their nests. Students will create and decorate their own bird houses with the option of making them into wind chimes as well. Create beautiful holiday ornaments or charms for presents! You will learn how to work with polymer clay using a variety of techniques that include rubber stamping, painting, embedding, and molding. No experience necessary. Participants are encouraged to bring additional embellishments from home such as jewelry, beads, ribbons, etc. It's Fall! Get ready for color! Learn how to cut, grind and arrange small pieces of glass to create brilliant and vibrant jewelry. You will make two pendants. No experience necessary. Bring your own project and materials. You can work in Water Soluble Oils, Watercolor or Acrylics. Teacher will assist each student with his/her project. *All levels welcome - beginning to experience painters. 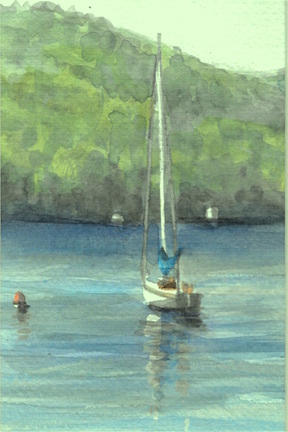 A Step-by-Step Approach to traditional watercolor techniques such as wet in wet, masking, the use of transparency, under painting and exploration of color mixing. Subject matter will include but not be limited to portraits, landscapes and still life. There will be ongoing demonstrations and the use of photographs. *Bring your own materials. *All levels welcome - beginning to experienced painters. Serious students ages 17 and older are invited to join artist Susan Jones Kenyon in creating land, sea or dreamscapes using Golden Open Acrylics and water-based oils. Brushes, paints and two canvases will be provided. *All levels welcome - beginning to experienced painters. Interpret the colors of your favorite photos, be it a landscape, person, still life, or abstract design. Bring two of your favorite photos to recreate on canvas in acrylic or water-based oils. Open to adults of all levels. Please bring a cool whip or margarine type container with a lid. * All materials included. Come inside and paint in oil or acrylic with artist, Mary Nolan. Students will be working from photographs and some experience is required. 'Tis the season! The holidays are here and what better way to celebrate than to create some wonderful homemade gifts for your family. Each child will be provided with materials to make a beautiful craft and wrap it, ready to surprise whoever they wish to receive it! A glittering, glowing, special surprise for someone you love! As the weather gets colder and the snow starts to fly, come create some owl ornaments! Using an assortment of items, as well as recycled bottle caps, buttons, and some glitter, these are sure to sparkle in your home! Hang in your room or in the house for decoration, or on the tree for the holidays! Get ready for the holiday season with a beautiful craft you can display at home! Welcome your friends and family with a festive wreath complete with glitter, leaves, feathers, glass gems, and more! Each student will then create their own unique turkey for the center of the wreath! Instead of sitting at home, spend your day off making crafts! To gear up for Halloween each child will complete two crafts, one in the morning and one in the afternoon with a break in between for lunch. Want to share your memories but never got o write them up? How about capturing your stories in paint? Even if you've never painted before, folk art is a great way to give voice to your creative side and tell your own story. One painting can contain scenes from your daily life or put together special memories commemorating a holiday, wedding, anniversary, birthday, or other special event. Pat Wiley, a local folk artist who recently exhibited at the Arkell Museum and Canajoharie Library, will help you capture your own story in acrylic paint. By the end of this workshop, you will leave with your finished painting and some tips on how to keep going on your own. Students will create a finished cut-paper collage in the eight hour total class time. Alexander's extensive collection of beautiful art papers, archival glues, and lasting substrates will be used. Process and composition addressed individually and as a group. Beginners and working artists alike are welcome. Interpret the moods of the land, water and sky with the medium of water soluble oil or acrylic paint. Open to all skill levels. * All materials included. Explore the impressionist style with award winning plein air artist Greg Barnes as your personal guide. Greg tailors his instruction to reach all levels from beginning to advanced techniques. Working from photographs or on location, the class will focus on capturing the essence of a scene through design, color harmonies, and intuitive interpretation. Greg will focus primarily on pastel techniques, although oil and acrylics are welcome. 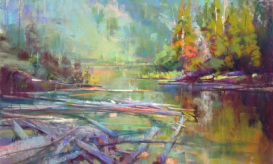 Each class typically begins with a pastel demonstration and lecture by Greg, focusing on different aspects of producing a captivating landscape painting. The remaining time will be spent at your easel, painting from your own photos or from life. He will visit each easel as you paint, giving individual instruction and personal attention. The class will also include critiques of each student's work in order to pinpoint areas of strength and potential growth. About your instructor: Greg Barnes received a Bachelor of FIne Arts degree from Wake Forest University in 1985. He began painting full time following the 911 incident of 2001, when he realized "life is short." He studied with Albert Handell and Scott Christensen early in his professional career. Currently he tours the country displaying his paintings in national art festivals, participating in plein air events, and teaching. Annually he earns numerous awards for his pastel paintings, including the "Crowd Favorite" award at the Aspen Plein Air Invitational, July 2013. This class will focus on interpreting landscapes from photographs and concentrate on developing space and mood and is intended for students with past experience. This class is for the student with past experience with oil painting and is taught onsite with the location changing each week. Students are given the opportunity to learn the techniques of oil painting while working from life.